If you don’t like the San Francisco 49ers as 2-point home dogs this Thursday night football against the Los Angeles Rams, maybe you’ll prefer San Francisco at +8 instead. No rest for the wicked: San Francisco goes back to the salt mines this Thursday Night Football (8:25 p.m. ET, NFLN), and by the salt mines, we mean that abomination of a stadium they built in Santa Clara. The Los Angeles Rams provide the opposition; our expanded consensus reports at Sportsbook Review show 65 percent of bettors dumping 78 percent of the amount wagered on the Rams, who are 2-point road faves at press time. Guess they don’t like the Niners at +2. But how about +8? 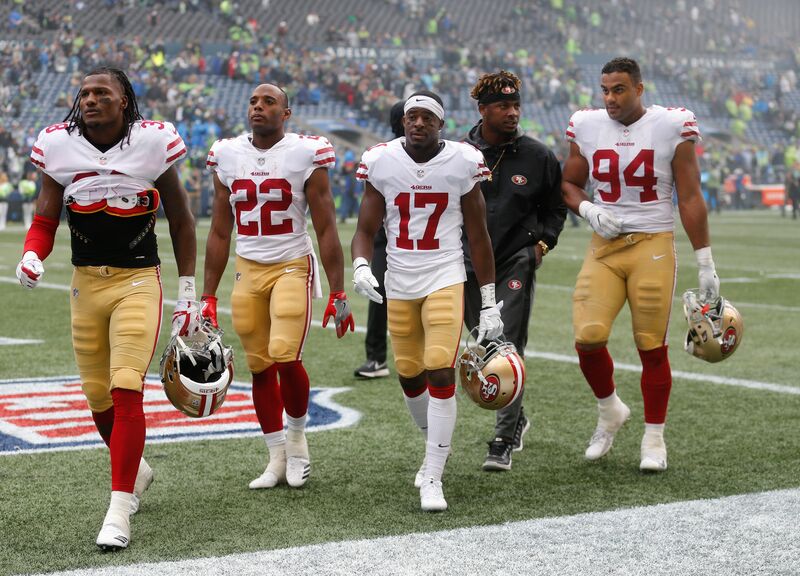 Whats up with the 49ers? Not only did they cover the spread for the first time this year, they almost beat the Seattle Seahawks straight up. In Seattle. As 13.5-point underdogs. Alas, the Niners gave up a fourth-quarter touchdown to lose 12-9. Suffice to say, if you own any stock in the Seahawks, you might want to dump it pronto. That offensive line is hot garbage. That’s the power of the 6-point NFL teaser. As we discussed in our introduction to playing teasers, there’s a potential for value when you have an underdog at +1.5, +2 or +2.5 (or a favorite at –7.5, –8 or –8.5). That makes the Niners a candidate to go into this special combo bet. Teasing them from +2 to +8 takes us across the magic numbers 3 and 7, greatly enhancing their chances of holding up their end of the bargain. This is called the Wong Teaser, as in Stanford Wong, who wrote Sharp Sports Betting in 2001 and told us all about these gems. That wasn’t too painful. There may be some other games that will work as Wong Teasers by the time you read this; we could have put the Seahawks in here as 2.5-point road dogs against the Tennessee Titans, but the ‘Hawks are also available at +3, so there’s no incentive at taking them for a worse price just to put them in the teaser. Anyway, according to the NFL stats at Wizard of Odds, you can expect this 8-team, 6-point teaser to cash in 8.27 percent of the time, all other things being equal; at a 15-1 payout, that means 32.25 percent in expected value. Will putting NCAAF teams in your teaser mess up those numbers? We doubt it would have that much effect, but full disclosure, we’re not sure. If you want to play it safe, you could always stick with a 3-team NFL teaser using the above lines and pull in 9.94 percent expected value, cashing in about 39.26 percent of the time at a 1.8-to-1 payout. Make sure the sportsbook you’re targeting offers these payouts, by the way – some are more generous than others. Shop smart, enjoy the football, and may the prolate spheroid be with you.